Getting our weight under control is something most adults struggle with. Being overweight is never something that has a pleasant ring to it. While it is wrong to body shame or place improper emphasis on one’s weight, being overweight is not only something that will affect your self-esteem but it also affects your health. This is why you should try to maintain a healthy body weight from a young age. Being overweight growing up is never easy, so here are some tips to help kids lose weight in a healthy way. Exercise is an important part our lives and studies show that with time, the human race is becoming less active. This is why it is recommended that you should get at least 60 minutes’ worth of active exercise a day. While hitting the gym is what most people think of a solution, as a child, the healthier option is to join a sport team. The benefits of joining a team is not only physical but also psychological. It not only builds up self-esteem but it also benefits your child’s of social interaction and team work skills. Another way to maintain a healthy body weight is by way of a healthy diet. When the word diet comes up your mind automatically goes to starving yourself and being grumpy all day from the lack of food. 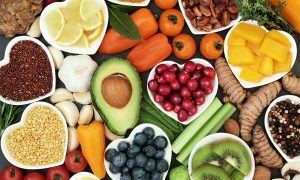 But this is not what I am referring to, in order to maintain a healthy diet, you should increase your intake of fruits and vegetables and proteins and lower your intake of unhealthy fatty foods. So next time instead of hotdogs fill your kids lunch box with fresh veggies and fruits. Also the less processed foods and fast foods you eat, the healthier you will feel. While watching what you put in your kids lunch boxes, another way you can help your child maintain their weight is by limiting their screen time. The time we spend suspend in front of our screens are now increasing at a frightening rate. While this is sometimes unavoidable, the lesser time your child spends in front of a screen is better for their health. Instead have them spend that time outside or playing a sport. Another tip to helping your child maintain a healthy body weight is by making sure that they get their 8 hours of sleep. Studies have shown that children who have less sleep than what is recommended tend to have an unhealthier weight than those who do. They key to letting your child have a proper night’s sleep is to make sure that there are no electronic devices that could interrupted their sleeping patterns. Being overweight is never fun but some of us have been so since we were children. If we can take a step towards getting this under control at an early age, the happier we will be.